One of my favourite hobbies is swimming, I go to Platinum Gym Kaifan to swim nearly everyday in thier 20-something meters pool, but I hate it now, it’s getting so crowded, I can’t swim a proper lap without bumping into someone or without lifting my head up to see if the path is clear every time, plus I need a larger pool anyway. So I decided to leave Platinum before the end of this month and join a real pool, a 50m olympic sized swimming pool. I’ve been asking my freinds who have been swimming on sports clubs before, if they know any 50m pools, either public or private, I’ve also done some digging myself. 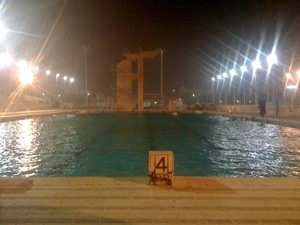 I started visiting Khaitan Sports club – Khaitan, its an open pool, not my taste. Monthly subscription 25kd, open for anyone. 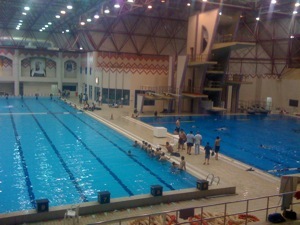 Al-Yarmook Sports club in Mishref – much better, same subscription, open for anyone. I also visited Qadsiya Sports club – in Hawally- but didn’t took any pictures unfortunately, but it looked newer than Al-Yarmook club. 3 days per week only, and I have to pay for a trainer, I passed it. 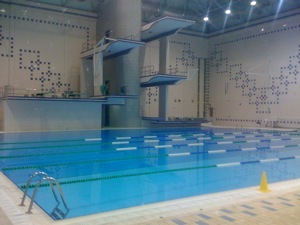 I heard that other olympic pools are in Al-Tathamun S.C, Al-Jahra S.C, Al-Naser S.C, but I haven’t visited them yet. I also heard that Khazema S.C are building a new olympic pool due in 2010 maybe. But I’d like to note that some clubs only accept people under 18 like the case with Kuwait sports club in Kaifan – stupid I know. 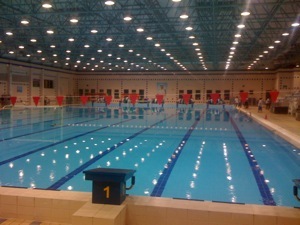 There aren’t any commercial olympic sized pools (50m) in Kuwait other than the ones at the sport clubs as I’ve heard later on, I will keep this post updated with more findings however. As for now I will join Al-Yarmook S.C since thier opening times suits me the best, everyday exepct friday. 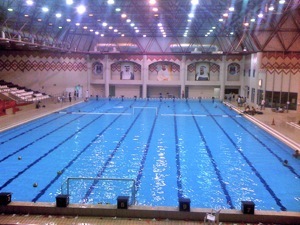 If I forgot to mention a sports complex with a 50m pool, I’d love to hear it in the comments below, thanks ! i really for ur great post. i was hungrily seeking such kind of information about swimming pools in kuwait. am a swimming fan too but unfortunately i didnt know where to go. once i went to the Swimming Pool Complex in salmiya and it was really crap S**T. its full of boys that only gods knows what r they doing inside. i tried it once and i was scratching my whole body for two weeks. once i called Qadsiya Club and they told its not open for the public. but if its open now it will be fantastic. and by the way is there any formal tests, or what ever, to subscribe to any of the pools u mentioned? Hi I am a 26 year old female and I may have a mild phobia of water or drowning. I have been looking around for professional instructors & swimming classes to help me with this fear. You seem to know quite a bit about the swimming scene in Kuwait. Is there anyone or anyplace you could recommend for me ? I would really just like to enjoy swimming and go diving some day. I am about to visit Kuwait again and appreciate you putting all of this together. I am now swimming every week trying to keep in shape, and I love it,so peaceful. I will have to see which one of these pools are closer to my work. ..` I am really thankful to this topic because it really gives useful information .;. Outstanding publish, I just given this onto a fellow employee who was doing a little study on this. And he in fact purchased me breakfast due to the fact I discovered it for him? smile.. So allow me to reword that: Thnx for the deal with! But yeah Thnkx for taking the time to discuss this, I really feel strongly about it and get enjoyment understanding far more on this leadingic. If possible, when you create expertise, would you mind updating your weblog with additional details? It is highly beneficial for me. Two thumb up for this article! Hi. I don’t know how to thank you about this post. I used to swim daily in Marina open beach I really enjoyed it, also it is way cleaner than swimming pools specially in the summer where it is so crowded. However, winter is getting closer and I’m looking for closed and suitable swimming pools to continue my daily exercises. please i would like to know if these places are for women and men together? or do they have certain days just for women? and also do any of these places you mentioned have a gym as well? let me know. thanks. Hi, I have the same question for hours for women. Do you have the phone number for Al Yarmouk and Al Arabi sports club? Thanks. Hi, I am looking for a pool for my daughter, can you help me if you know any info on pools for kids between 9-11 yrs. Appreciate your help, and this indeed is a good post you have on the swimming pool info. I would Like to ask if anyone who knows olympic pool in salmiyah that is cheap and Clean? I mean near to salmiyah Area. I wanna thank you so much for making this public. do you have Al-Yarmook Sports club number?.